View basket “Vintage Recipe Book Table Confetti Sprinkles” has been added to your basket. We looked everywhere for chalkboard table confetti sprinkles but could find none – so we had no option but to make our own! 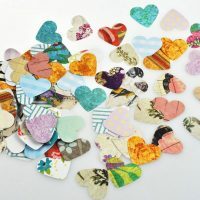 100 pieces of heart-shaped chalkboard table confetti sprinkles, hand-cut from quality paper with a chalkboard design on one side and pastel pattern on the back. Designs may not necessarily be exactly the same as shown as we will be cutting from chalkboard paper that is available when you order. Each heart measures 2.5 cm. Check out our other matching chalkboard products in that category!